The Matrix Remover with slitter rewinder is a compact desktop machine used to finish digitally printed labels printed on many of our desktop digital label printers. It is particularly useful if wanting to use your roll label printer to print full bleed colour labels with a bleed border and waste left on to make sure the spare ink is rapid dry in the waste borders. Then the Matrix Remover is used to strip off the waste matrix border and make neat rolls of finished labels that can be hand or machine applied. 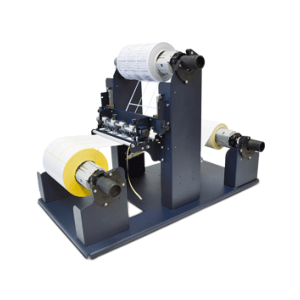 If needed the machine has mountable slitter blades so to automatically slit smaller printed labels into lanes and rewind them several rolls at a time onto the rewinder in one pass. When doing the latter it is important to have a supply of correct width cores to to mount onto the take up winder shaft to ensure the rolls can be easily removed after stripping slitting and winding. The machine can also be used as a general purpose label slitter without using the waste removal shaft if labels are already die-cut with gaps and gutters for example say 2, 3, 4 across the roll.